I like Stephen West’s knitted shawls and am always trying to figure out a way to translate them into crochet. For this prototype, I used a DK weight yarn and a “J” hook. It is easily adjustable to a smaller gauge, if you want to use a sock yarn. Just work the central panel until it is half the depth you want the finished object to be, then start the secondary angles. The straight sections will have more stitches, but once you get started, it’s not hard at all. This is meant to be more of a recipe, although I have written out the directions line by line for a nice sized shawlette with the DK weight yarn. There is also the option of continuing the center panel without the side angles. One other thing about the pattern, it is reversible. Either way looks nice! Note: This pattern can be done to any size with any hook and yarn combination. Blocking is optional. Row 1: Ch 4. (4 dc, ch 2, 5 dc) in fourth chain from hook, turn. Row 2: Ch 3. Make 2 dc in same st, dc in next 3 sts, fpdc around next st. (Dc, ch 2, dc) in ch-2 sp, fpdc, dc in next 3 sts, 3 dc in top of turning chain. Turn. Row 3: Ch 3. Make 2 dc in same st, dc in next 5 sts, bpdc in next 2 sts. (Dc, ch 2, dc) in ch-2 sp, bpdc in next 2 sts, dc in next 5 sts, 3 dc in top of turning chain. Turn. Row 4: Ch 3. Make 2 dc in same st, dc in next 7 sts, fpdc in next 3 sts. (Dc, ch 2, dc) in ch-2 sp, fpdc in next 3 sts, dc in next 7 sts, 3 dc in top of turning chain. Turn. Row 5: Ch 3. Make 2 dc in same st, dc in next 9 sts, bpdc in next 4 sts. (Dc, ch 2, dc) in ch-2 sp, bpdc in next 4 sts, dc in next 9 sts, 3 dc in top of turning chain. Turn. Row 6: Ch 3. Make 2 dc in same st, dc in next 11 sts, fpdc in next 5 sts. (Dc, ch 2, dc) in ch-2 sp, fpdc in next 5 sts, dc in next 11 sts, 3 dc in top of turning chain. Turn. Row 7: Ch 3. Make 2 dc in same st, dc in next 13 sts, bpdc in next 6 sts. (Dc, ch 2, dc) in ch-2 sp, bpdc in next 6 sts, dc in next 13 sts, 3 dc in top of turning chain. Turn. Row 8: Ch 3. Make 2 dc in same st, dc in next 15 sts, fpdc in next 7 sts. (Dc, ch 2, dc) in ch-2 sp, fpdc in next 7 sts, dc in next 15 sts, 3 dc in top of turning chain. Turn. Row 9: Ch 3. Make 2 dc in same st, dc in next 17 sts, bpdc in next 8 sts. (Dc, ch 2, dc) in ch-2 sp, bpdc in next 8 sts, dc in next 17 sts, 3 dc in top of turning chain. Turn. Row 10: Ch 3. Make 2 dc in same st, dc in next 19 sts, fpdc in next 9 sts. (Dc, ch 2, dc) in ch-2 sp, fpdc in next 9 sts, dc in next 19 sts, 3 dc in top of turning chain. Turn. Row 11: Ch 3. Make 2 dc in same st, dc in next 21 sts, bpdc in next 10 sts. (Dc, ch 2, dc) in ch-2 sp, bpdc in next 10 sts, dc in next 21 sts, 3dc in top of turning chain. Turn. Row 12: Ch 3. Make 2 dc in same st, dc in next 23 sts, fpdc in next 11 sts. (Dc, ch 2, dc) in ch-2 sp, fpdc in next 11 sts, dc in next 23 sts, 3 dc in top of turning chain. Turn. Row 13: Ch 3. Make 2 dc in same st, dc in next 25 sts, bpdc in next 12 sts. (Dc, ch 2, dc) in ch-2 sp, bpdc in next 12 sts, dc in next 25 sts, 3 dc in top of turning chain. Turn. Row 14: Ch 3. Make 2 dc in same st, dc in next 27 sts, fpdc in next 13 sts. (Dc, ch 2, dc) in ch-2 sp, fpdc in next 13 sts, dc in next 27 sts, 3 dc in top of turning chain. Turn. Row 15: Ch 3. Make 2 dc in same st, dc in next 29 sts, bpdc in next 14 sts. (Dc, ch 2, dc) in ch-2 sp, bpdc in next 14 sts, dc in next 29 sts, 3 dc in top of turning chain. Turn. At this point, the shawl may be continued as established or the following instructions may be used to make a shawl more like the original knit version. Row 16: Ch 3. Make 2 dc in same st, (dc, ch 2, dc) in next st, dc in next 30 sts, fpdc in next 15 sts. (Dc, ch 2, dc) in ch-2 sp, fpdc in next 15 sts, dc in next 30 sts. (Dc, ch 2, dc) in next st, 3 dc in top of turning chain. Turn. Row 17: Ch 3. Make 2 dc in same st, dc in next 2 sts, bpdc in next st, (dc, ch 2, dc) in next st, bpdc in next st, dc in next 30 sts, bpdc in next 16 sts. (Dc, ch 2, dc) in ch-2 sp, bpdc in next 16 sts, dc in next 30 sts, bpdc in next st. (Dc, ch 2, dc) in next st, bpdc in next st, dc in next 2 sts, 3 dc in top of turning chain. Turn. Row 18: Ch 3. Make 2 dc in same st, dc in next 4 sts, fpdc next 2 sts, (dc, ch 2, dc) in next st, fpdc in next 2 sts, dc in next 30 sts, fpdc in next 17sts. (Dc, ch 2, dc) in ch-2 sp, fpdc in next 17 sts, dc in next 30 sts, fpdc in next 2 sts. (Dc, ch 2, dc) in next st, fpdc in next 2 sts, dc in next 4 sts, 3 dc in top of turning chain. Turn. Row 19: Ch 3. Make 2 dc in same st, dc in next 6 sts, bpdc in next 3 sts, (dc, ch 2, dc) in next st, bpdc in next 3 sts, dc in next 30 sts, bpdc in next 18 sts. (Dc, ch 2, dc) in ch-2 sp, bpdc in next 18 sts, dc in next 30 sts, bpdc in next 3 sts. (Dc, ch 2, dc) in next st, bpdc in next 3 sts, dc in next 6 sts, 3 dc in top of turning chain. Turn. Row 20: Ch 3. Make 2 dc in same st, dc in next 8 sts, fpdc next 4 sts. (Dc, ch 2, dc) in next st, fpdc in next 4 sts, dc in next 30 sts, fpdc in next 19 sts. (Dc, ch 2, dc) in ch-2 sp, fpdc in next 19 sts, dc in next 30 sts, fpdc in next 4 sts. (Dc, ch 2, dc) in next st, fpdc in next 4 sts, dc in next 8 sts, 3dc in top of turning chain. Turn. Row 21: Ch 3. Make 2 dc in same st, dc in next 10 sts, bpdc in next 5 sts. (Dc, ch 2, dc) in next st, bpdc in next 5 sts, dc in next 30 sts, bpdc in next 20 sts. (Dc, ch 2, dc) in ch-2 sp, bpdc in next 20 sts, dc in next 30 sts, bpdc in next 5 sts. (Dc, ch 2, dc) in next st, bpdc in next 5 sts, dc in next 10 sts, 3 dc in top of turning chain. Turn. Row 22: Ch 3. Make 2 dc in same st, dc in next 12 sts, fpdc next 6 sts. (Dc, ch 2, dc) in next st, fpdc in next 6 sts, dc in next 30 sts, fpdc in next 20 sts. (Dc, ch 2, dc) in ch-2 sp, fpdc in next 20 sts, dc in next 30 sts, fpdc in next 6 sts. (Dc, ch 2, dc) in next st, fpdc in next 6 sts, dc in next 12 sts, 3 dc in top of turning chain. Turn. Row 23: Ch 3. Make 2 dc in same st, dc in next 14 sts, bpdc in next 7 sts. (Dc, ch 2, dc) in next st, bpdc in next 7 sts, dc in next 30 sts, bpdc in next 21 sts. (Dc, ch 2, dc) in ch-2 sp, bpdc in next 21 sts, dc in next 30 sts, bpdc in next 7 sts. (Dc, ch2, dc) in next st, bpdc in next 7 sts, dc in next 14 sts, 3dc in top of turning chain. Turn. Row 24: Ch 3. Make 2 dc in same st, dc in next 16 sts, fpdc next 8 sts. (Dc, ch 2, dc) in next st, fpdc in next 8 sts, dc in next 30 sts, fpdc in next 22 sts. (Dc, ch 2, dc) in ch-2 sp, fpdc in next 22 sts, dc in next 30 sts, fpdc in next 8 sts. (Dc, ch 2, dc) in next st, fpdc in next 8 sts, dc in next 16 sts, 3 dc in top of turning chain. Turn. Row 25: Ch 3. Make 2 dc in same st, dc in next 18 sts, bpdc in next 9 sts. (Dc, ch 2, dc) in next st, bpdc in next 9 sts, dc in next 30 sts, bpdc in next 23 sts. (Dc, ch 2, dc) in ch-2 sp, bpdc in next 23 sts, dc in next 30 sts, bpdc in next 9 sts. (Dc, ch 2, dc) in next st, bpdc in next 9 sts, dc in next 18 sts, 3 dc in top of turning chain. Turn. Row 26: Ch 3. Make 2 dc in same st, dc in next 20 sts, fpdc in next 10 sts. (Dc, ch 2, dc) in next st, fpdc in next 10 sts, dc in next 30 sts, fpdc in next 24 sts. (Dc, ch 2, dc) in ch-2 sp, fpdc in next 24 sts, dc in next 30 sts, fpdc in next 10 sts. (Dc, ch-2, dc) in next st, fpdc in next 10 sts, dc in next 20 sts, 3 dc in top of turning chain. Turn. Row 27: Ch 3. Make 2 dc in same st, dc in next 22 sts, bpdc in next 11 sts. (Dc, ch 2, dc) in next st, bpdc in next 11 sts, dc in next 30 sts, bpdc in next 25 sts. (Dc, ch 2, dc) in ch-2 sp, bpdc in next 25 sts, dc in next 30 sts, bpdc in next 11 sts. (Dc, ch 2, dc) in next st, bpdc in next 11 sts, dc in next 22 sts, 3 dc in top of turning chain. Turn. Row 28: Ch 3. Make 2 dc in same st, dc in next 24 sts, fpdc next 12 sts. (Dc, ch 2, dc) in next st, fpdc in next 12 sts, dc in next 30 sts, fpdc in next 26 sts. (Dc, ch 2, dc) in ch-2 sp, fpdc in next 26 sts, dc in next 30 sts, fpdc in next 12 sts. (Dc, ch 2, dc) in next st, fpdc in next 12 sts, dc in next 22 sts, 3 dc in top of turning chain. Turn. Row 29: Ch 3. Make 2 dc in same st, dc in next 26 sts, bpdc in next 13 sts. (Dc, ch 2, dc) in next st, bpdc in next 13 sts, dc in next 30 sts, bpdc in next 27 sts. (Dc, ch 2, dc) in ch-2 sp, bpdc in next 27 sts, dc in next 30 sts, bpdc in next 13 sts. (Dc, ch 2, dc) in next st, bpdc in next 13 sts, dc in next 26 sts, 3 dc in top of turning chain. Turn. Row 30: Ch 3. Make 2 dc in same st, dc in next 28 sts, fpdc next 14 sts. (Dc, ch 2, dc) in next st, fpdc in next 14 sts, dc in next 30 sts, fpdc in next 28 sts. (Dc, ch 2, dc) in ch-2 sp, fpdc in next 28 sts, dc in next 30 sts, fpdc in next 14 sts. (Dc, ch 2, dc) in next st, fpdc in next 14 sts, dc in next 28 sts, 3 dc in top of turning chain. Turn. Row 31: Ch 1, sc in all stitches, working 3 sc into each ch-2 space. Turn. Row 32: Ch 1, sc in back loops across row. Fasten off, weave in ends, and block. together in new or different ways. My daughter keeps me busy, but I try to sit down and do a little bit each day. It helps keep my sanity intact. 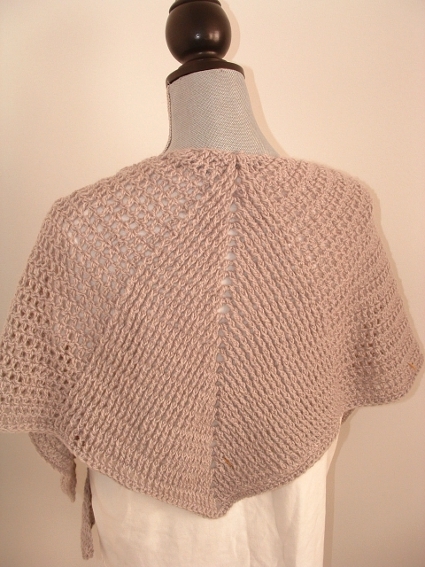 If you don’t mind losing the “ribbing” details at the angles, then you can just work plain double crochets. Just make sure to work the (dc, ch2, dc) into the ch2 spaces used to make the angles at the center and on the sides. great pattern! I love the shaping and details. I’m on a major shawl “kick” right now, both because I love shawls and I need to do a major destash of yarn, so this helps me out in both ways! It’s now in my Ravelry queue! 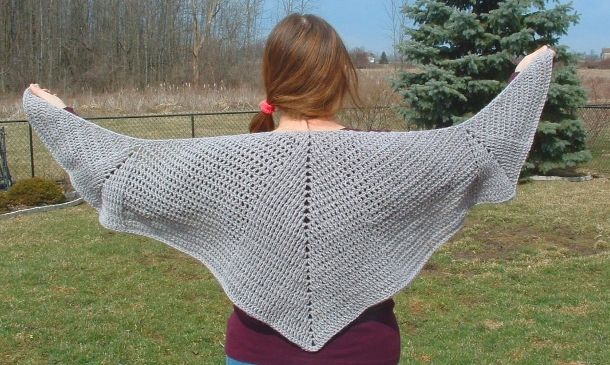 This shawl is beautiful! I love the geometric design and the look of the textured raised stitches. Now it’s just a matter of heading to my local yarn store for the materials! Lovely shawl pattern. I am in the middle of working it up. Do you realize you have an error in the pattern in rows 22 to 30? In row 22 you repeated the same number of stitches in the center for the fpdc (20) as you did in row 21 for the bpdc on both sides of the center. Therefore your count in the center is off by one for all of the rows after 22! The rest of the stitch count for the sides are okay. Just thought you would like to know so you could make that correction.